Join us Wednesday, February 6, 2019 in the BizSugar Mastermind Community. Ann Smarty, Founder of Viral Content Bee, will be explaining how to use the Google Featured Snippet tool and answering your questions live. Would you like a 20-30% increase in traffic to your site? What about higher click-through-rates (CTRs)? Both are possible when you focus on landing more Featured Snippets for your business. 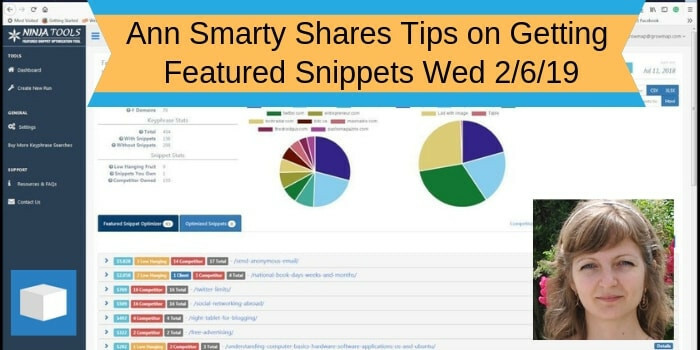 As Ann Smarty wrote for Moz, “Being featured means getting additional brand exposure in search results.” Fortunately for us all, Ninja Tools has made it much easier by creating their Google Featured Snippet tool. Join us to find out how you can get more Featured Snippets for your business! Bookmark this page because we will be updating this post. Come back to read some of the advice Ann shares during the live event. You are invited to join our Mastermind Community and participate in the live Q&A, use our free tools, and see all of the tips Ann and our other special guests share. Already a member? Go directly to the event here. Wonder what’s going on in the Live Event? Answers to all these questions can be found by members here. Philip Verghese ‘Ariel’ of NewsandViewsforYou asks: Is it good or risky to republish existing content with a new date? If you are a regular commenter on other bloggers’ sites, or in response to content published in your authorships on many sites, would you recommend NOT linking to your own site from those comments? Or linking from 1 and then not from others? Would being a regular commenter in blogs and linking back to your site in the name and/or CommentLuv field reduce your Majestic TrustFlow score? Pros and cons of encouraging comments versus turning them off. What about using different commenting systems? Do you believe they will help or hinder getting more Featured Snippets – or not matter at all? Should writers who have subject matter expertise in a primary topic need to use a separate author identity if they write about anything outside that to avoid damaging what Google sees as your primary niche? Want to know the answers to these questions? Join our Free Mastermind Community here and visit that forum post here. Thank you for such valuable information. I’m myself a digital marketer, actually a newbie so I was researching on seo & thankfully got this content, gonna help me for sure. It will only help if you join the Mastermind and come see the answers to all the questions. I’ll be updating this post with those questions, but I assure you seeing the answers is more than worth your time. This has been a very informative session for me. I may have missed it but how long do you think it typically takes to start appearing within featured snippets that are pretty competitive or common. What would you say is the #1 factor for it? I’ve asked Ann to answer your question in the Forum where she answered all the others. Great article Ann and wonderful training on understanding how to optimize your pages for Google Snippets. I spent about 1 1/2 hours engrossed in further research on the topic. Of course, like everyone else, I SAW the Snippets, but didn’t give much attention to them. Thanks again for the enlightenment. P.S. Till now I had only seen you in Instagram or FB pics (LOL). Did you see there are actually 2 videos about Featured Snippets on the Ninja site? The tools is so cool because all you have to do is enter your site’s URL and it tells you what snippets you have and what content is close enough to possibly land more snippets. Definitely check out the tool and the videos.